The City of San Diego bills itself as a Golfers Paradise, and with 40-plus courses, majestic ocean settings, huge mountains and canyons, along with 300-plus days of sunshine, it's easy to see why. If San Diego is truly a paradise for hooked hackers, then the city owned and operated Torrey Pines Golf Course is likely the crown jewel. First-timers to Torrey Pines should forget every negative thought they may have about city golf courses. Forget the old and crumbling clubhouse, forget the non-existent maintenance, the over-baked greens, the fairway browns, and the bunkers with little sand and water fountains which haven't worked in years. Forget all of that when you arrive at Torrey Pines, because the course, which has hosted the PGA Tour's Buick Invitational since 1968 and produced professional golfers like Billy Casper and Phil Mickelson, will shatter all your misconceptions about poor municipal layouts. The 36-hole complex, opened in the early 1950s, offers both the North and South Course and both are always in excellent shape. There is plenty of rough, lush fairways, trees everywhere, lots of bunkers and sand, and plenty of golf history everywhere. It was at the South Course that Tiger Woods shot a third round 62 to win the 1999 Buick Invitational and the same course where Mickelson, the hometown hero, stopped Woods' six-tournament winning streak at the 2000 Buick Tournament. But what sets Torrey Pines apart from most of its competitors, municipal or otherwise, is the spectacular natural scenery the course is laid out on. On the South Course, there are seven holes with direct views of the Pacific Ocean, a hundred yards below the links, and several more with views of a huge natural canyon with the nearby mountains almost always in the background. It's as pretty a golf course scene as its much more publicized and much higher- priced Northern California neighbor, the Pebble Beach Golf Links. Add to that all manner of activities in the skies over the course, from hang gliders who float lazily over the course, from the next-door launching station, to screaming jets from the nearby Top Gun Fighter School base, to slowly moving helicopters headed to their next duty assignments at one of the area's many military bases. It's an aerial ballet you may not see at the finest of air shows, but it all adds to the charm, beauty and uniqueness of a round of golf at Torrey Pines Golf Course. 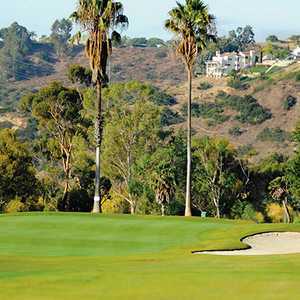 While PGA Tour golfers play both courses during their annual visit in February, the South Course always hosts the last two rounds and should be the first choice of golfers making their initial visit to the facility located in the exclusive section of San Diego known as La Jolla. The opening hole gives golfers an early insight into what they can expect from the par 72 Torrey Pines South Course. Playing a stern 447 yards from the back tees, the par 4 bends slightly from left to right with sand, thick rough and plenty of trees all along the right side. Among the many tree varieties at Torrey Pines are plenty of namesake pines, low-bending eucalyptus, along with oak and plentiful native shrubs. The greens are not especially small, but can be very undulated with the pins put in very difficult positions to reach. An opening par is not an easy assignment, but will give golfers an idea of what they have to face in the upcoming holes. After a relatively short par 4 second hole, the fun really begins on the par 3 third hole which slopes sharply downhill to the green perched on a cliff directly above the ocean. At 173 yards from the back tees, golfers should always check the winds, which come in constantly from the ocean, but can swirl in many different directions. A pair of bunkers guard the front entrance to the greens to catch any short shots, while ocean and cliffside wall shallow up any shot which overshoots the green. This is also a prime spot for the hang guilders and it's not unlikely to see two or three perched above the green as you prepare to hit. The par 4 fourth hole is rated as the number one handicap hole on the course and at 453 yards from the back tees, it's easy to see why. The ocean runs all along the left side making any hooked shots off the tee likely lost and wet. Trees block out any shot to the green from the left rough while bunkers and thick shrubs guard the right. The green is one of the smaller surfaces on the course with deep bunkers placed in front and back of the area. The par 4 sixth has a narrow driving area at 404 yards from the back makers and one of the last good looks of the ocean as the course heads inland for the next several holes. Holes seven and eight play along the huge natural canyon which comes into play on several of the Torrey Pines layouts. While no holes actually require a shot over the canyon, it can shallow up some misplaced drives and certainly adds to the overall beauty. The back nine begins with a fairly short par 4, while the par 3 11th is a tricky layout as a small stream is hidden off the tee box, but because the hole plays 200 yards from the back markers and is often into the wind, the water can definitely come into play. The 12th is a long (468 yard) par 4 uphill and into the wind. Two excellent shots are needed to find the green in regulation and the hang guilder/parasail launch site runs parallel to the fairway on the left side, which can distract the golfer for a few, often fatal, seconds. The par 5 13th is another very good test because the canyon runs along the left side and thick shrubs and trees line the right. Two long, straight drives are needed to have any chance of success on the hole which slopes downward to a grassy gully then moves sharply uphill on the approach to an often blind third shot to the green. Tee shot placement is the key to success on the par 4 14 and 15th holes. A long, straight shot can set you up for par or even birdie, but straying off the fairway and into the nearby trees will produce more adventure than most golfers want. Most of the fairways on the back side also narrow closer to the green and bend in location - meaning your straightest ball may not be your best choice. The par 3 16th, which is slightly uphill at 205 yards from the back tees, offers the last good look at the ocean and a good chance for par or birdie provided you can hit the narrow green with your first shot from the tee box. 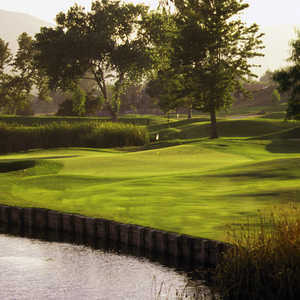 The finishing 18th is a par 5 with plenty of trees, rough and sand on the right side, brush and more trees on the left. A small ponds sits just left of the green and has drowned more than a couple of golfer's, pro and amateur, hopes for a big finish. 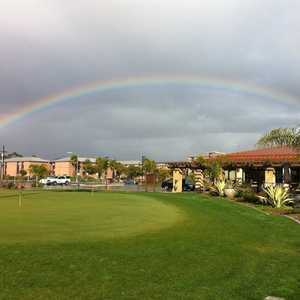 Need one more reason to put Torrey Point near the top of your list for the next San Diego golf trip? The price for local residents is an amazingly low rate of $26 dollars. Even the high season rate of $85 for visitors is considerably less than what some courses charge in the area and a bargain for a golf experience this good. Currently, there is a Hilton Hotel located just off the 18th fairway with guaranteed tee times, and a new Lodge at Torrey Pines located next to the 18th green will be ready in 2002. Beauty, challenge, location and history. Torrey Pines has the total package and seems to be constantly polishing its crown as San Diego's crown jewel in this aptly named golf paradise. Facilities offered: 36 holes of championship golf, practice facilities, golf school, on-site restaurant and lounge, nearby lodging.